Any invoice payments from your clients collected online via Harpoon’s online payment form will automatically be recorded by Harpoon and applied to the invoice. If instead you received your payment via check or another means you can manually record the payment by visiting the Invoice Details screen for the invoice and clicking on the Add a Payment action in the Actions panel. You’ll be presented with a Manage Payments form. 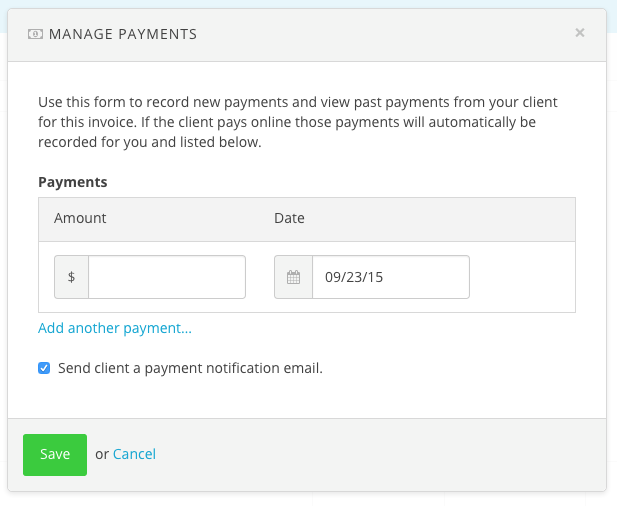 Here you’ll be able to record new payments and view past payments from your client for the invoice. 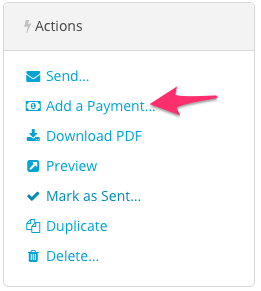 Any online payments for the invoice will automatically be recorded for you and listed here as well. To learn more about invoicing visit the Invoices support articles.